(ARA) - Paint can do more than change the color of a room - it can add texture, pattern and visual interest. Today's decorative painting techniques are simple and sophisticated alternatives to wallpaper, and a far cry from the dated sponge painting from years past. Whether you're a painting pro or a beginner, here's how you can transform a room with a few simple strokes. Give any room an extra bit of "oomph" with textured techniques. Easy to do and requiring few supplies, they're an excellent option for new DIYers. One simple technique is simulating the texture of fabric on walls - it makes any space feel warm and homey. To add a more masculine feel to a bachelor pad or study, use paint to create the appearance of leather on walls - apply a mix of glaze and brown paint to walls using a scrunched-up plastic bag to give the right texture. Once it is dry, use a roller to add a layer of brown glaze over it. You can also use textured techniques to easily create the look of linen for a light and airy feel, or to transform your walls to seem like wood or stone for an outdoorsy atmosphere. A technique called combing is also great for those new to decorative painting - it's simple to do and mistakes are easy to fix. To "comb" your walls, paint your base coat of color and let it dry completely, use a paint roller to apply a thin layer of clear glaze, and "comb" through the glaze with a special paint comb. If you don't like your first attempt, simply apply another coat of glaze with your paint roller and start over. 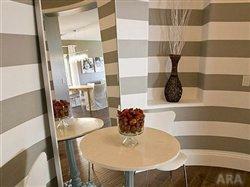 Simple but stylish, stripes are an easy way to update your space. Vertical stripes create the feeling of high ceilings, making rooms feel spacious, while horizontal stripes add a modern, funky touch. For a subtle look, paint two-toned stripes in neutral hues - such as cream and taupe - or use the same color in two different sheens (i.e. glossy and flat). For a more dramatic redo, choose two contrasting colors, create multicolored stripes or paint stripes in a variety of widths to add extra interest. When painting stripes, measure carefully and use a laser level to apply tape to ensure the lines are straight. Always remember to paint your base coat with the lightest color first since it will eventually become one of the stripes, and it is much easier to paint your darker colors over the lighter base. Then add the darker colored stripes, in order from lightest to darkest. To create stripes with the sharp, crisp lines you're looking for, choose FrogTape brand painter's tape. Treated with patented PaintBlock Technology, FrogTape reacts with the water in latex paint to create a barrier that prevents paint bleed and helps ensure clean lines. For stripes, FrogTape is available in a Delicate Surface technology - it is great for decorative painting because it can be applied to fresh paint after only 24 hours. A chic alternative to traditional stripes, chevron, or zig-zag stripes, is a way to make a big impact on your room with minimal effort. Create a pattern of many chevron stripes, or go for major drama with fewer, wider stripes. Paint the pattern around the entire room, or add chevron to one focal wall. To get the look, use pencil or chalk to create a grid on the wall; use a level to make sure the grid lines are straight. Then, apply painter's tape - FrogTape Delicate Surface is a good choice for this technique, too - to create the chevron pattern, utilizing your grid lines as a guide. After the painter's tape is applied firmly to the surface, paint in-between the taped design. Lastly, make sure to remove the tape as soon as you are finished painting. Make an ordinary space extraordinary with stencils. Nowadays, stencils are available in almost any shape and size. Buy them precut at your local craft store or online at etsy.com, or create your own for a design that is completely unique. Add floral designs for a feminine look, or go classic with preppy polka dots. Stencil a chandelier shape for instant sophistication or paint a meaningful quote to add a personal touch to your space. 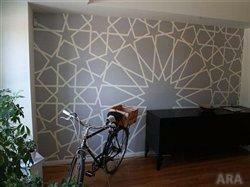 Geometric patterns, damasks and paisleys also add spice to boring walls. Some retailers even offer wall size stencils, helping you to cover a large area with ease. Whether you consider yourself shabby chic, prefer sleek modern looks or adhere to a more traditional style, decorative painting is a simple way to add flair to any space. With just a few supplies and a free weekend, you can transform any room into a space you adore.